I decided I could make these with my 4th graders, we just had to beef up the writing part. They made their ornament craft, and they wrote a descriptive paragraph of their favorite Christmas decoration. To make the lined paper to glue on the back of the ornament, I just printed off an extra copy of the ornament and added lines to it. It makes me happy that I can still squeeze in crafts for 4th grade. I have a couple more to share in the next couple of weeks, so stay tuned! Very cute! They look great hung up! 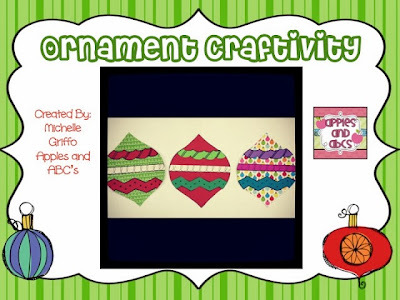 I love checking out your blog to see how you are adapting cute crafts to the upper grades! I miss kindergarten but love bringing the crafts, color, and joy to the upper grade kiddos too. They can do soooooo much more! How are you liking 4th grade? I love how you hung them from the ceiling Michelle - I bet your 4th graders are loving the crafts!! Too fun!